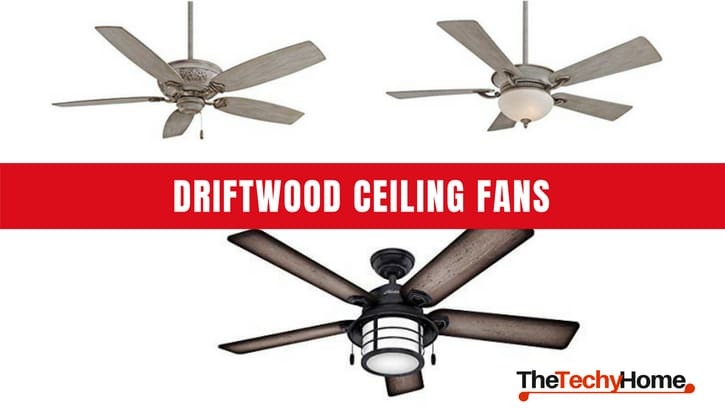 Driftwood ceiling fans are a very convenient tool for refreshing homes but not outdoor spaces such as decks. While they’re not as powerful as an air conditioner, they consume a lot less energy and still offer a very efficient way to blow heat away while avoiding the complications that cooling systems present. While standing fans are uncomfortable, occupy a lot of space and still doesn’t provide airflow for the whole room, these ceiling fans models are very convenient as they don’t occupy any room space. Also, the air is distributed evenly from above, avoiding that some parts of the room get cooled while others remain hot. Finally, many of these models include lamps, which make them the perfect combination of features for dark interiors. 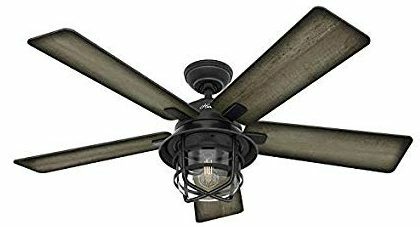 If you’re looking for the standard driftwood ceiling fan that also combines with your decoration, then this is the model for you. Very traditional but very powerful, with its 5 wide blades the Minka Aire F701-DRF will cool any room in a very quiet way. Ideal for bedrooms where this quietness is essential and with enough light to illuminate it even if there aren’t big windows and the room is dark. Nevertheless, thanks to the lamp with opaque walls, the light won’t be so that it bothers guests. The beautiful color of this Driftwood grey fan is perfect for matching almost any decoration and, as the design is elegant and an in-between contemporary and classic style, it is itself a piece of decoration. It can be mounted in angled ceiling up to 21º without extra pieces but would need to buy a separate adaptor for more angled ceilings. Finally, it includes wall controls, which are a great addition for comfort as you don’t depend on fragile cords to actually make it run. Two 50 watt Mini-can halogen downlight bulbs and Two 15 watt Candelabra uplight bulbs for a perfect indoors illumination. Also, the lamp is bone white glass with max downlight wattage of 100 watts. The wall control includes not only the three speeds for the fan but also a full range up and down light dimming control. Blades are 52” with 14º blade pitch which allows cooling down even big rooms. Includes angled ceiling adaptors for up to 21º angles. Doesn’t include adaptors for angles up to 45º angles. The wall-control doesn’t include a reverse feature but must be manually adapted in the fan itself. 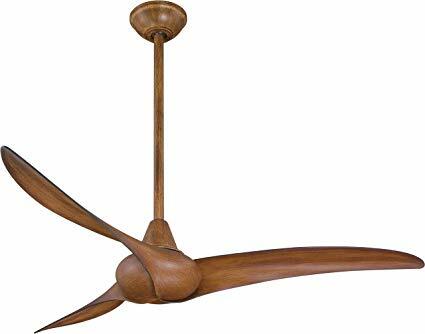 This driftwood ceiling fan is a jewel of decoration as it’s a driftwood finish ceiling fan but the style is completely classic, to match the most refined and elaborate decorations. Its five 54” blades are perfect for cooling down a big room, while you need to make sure the ceiling is high enough due to its low profile. As a classic fan, the controls are manual with a cord, which matches the design. It’s really quiet so it won’t bother at all in a bedroom but sadly you’ll have to buy the light kit separately, even though any Minka Aire light kit will fit. It comes ready to be installed on a 21º angled ceiling but if the angle is superior, you’ll need to buy extra parts. Unlike the previous model, it’s not exactly driftwood grey but has a greenish touch that is also pretty combinable and gives the sensation of an Antique piece. Its 5 wide blades with a pitch of 14º are more than enough for cooling even big rooms. The controls include three speeds so you can adapt the temperature to your preferences. Practically inaudible it won’t bother any guests during the night. Both speed and reverse controls are manual and must be managed in the fan itself. It doesn’t include a light kit. It doesn’t include adaptors for ceilings with an angle superior to 21º, for installing in the ceiling with 21º-45º you must buy the adaptors separately. It’s a bit large for low ceilings. If you’re into very contemporary and bold designs, then this distressed wood ceiling fan is the option for you. Incredibly aerodynamic and cottage style, with an incredible bronze/brown color, and that beautiful distress koa finish this Minka Aire model is ideal for both country and modern decorations. While this fan is definitely for indoors, it’s not recommended for bedrooms as it doesn’t include lights (nor can be adapted). Instead, it’s perfect for living rooms or big well-illuminated rooms where the light won’t matter but a great airflow is necessary (well, this one has that last feature!). Even though it has only three blades, their aerodynamic 48º pitch design allows them to drag much more air than regular blades so it would work even for semi-outdoor spaces. Just like all the Minka Aire models, you can adapt this one to angled ceiling up to 21º with no extra pieces but will need to buy separate parts for a more angled ceiling. Finally, it’s completely remote controlled so comfort is also a plus for high ceiling spaces. Included remote control with three speeds and a full range light dimming. You can even buy an extra bond hub to make it work with Alexa. Its aerodynamic blades offer great airflow that cools really big rooms such as livings or diners and even decks. It’s beautifully designed with a very elegant finish so it will match both country and contemporary decorations. It’s not too big so it can also be installed in low profile ceilings without bothering. It’s quite enough for the mentioned rooms. Doesn’t include lights and is not compatible with light kits. Adaptors for angled ceilings from 21° to 45° must be bought separately. Reverse controls only manual in the fan. 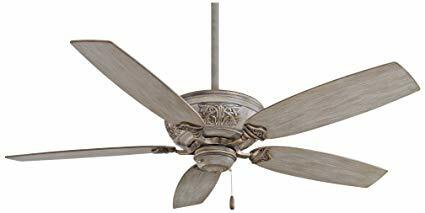 Without a doubt, this Hunter fan is one of the best polished nickel ceiling fans you’ll find in the market. With an incredible quality, very functional features and a state-of-the-art design, this fan will deck up any room of your house. The polish nickel shines really bright and in combination with the carved wood blades they emphasize the center of the fan, which is the most remarkable piece of design in the whole fan; a lamp made of seeded glass in a globe-like design featuring 4 candle visible bulbs that remind of the 20’s-40’s aesthetics. Controlled by a handheld remote and with WhisperWind motor technology, this fan promises to be the attention caller of any large room, dinner, living room or master room. Incredibly quiet while very powerful, ideal for large bedrooms or even one-piece apartments. Automatically reversible for adapting the flow of air according to the temperature (down for hot days, up for cold days). Remote controller allows full range dimming for the lights and fan speeds as well as reverse function. Includes 2” and 3” downrods for installing at the height of your preference. Not ideal for small rooms. It doesn’t include pieces for installing at an angled ceiling; nevertheless, they can be bought separately. Users report it’s hard to install if you’re not handy. 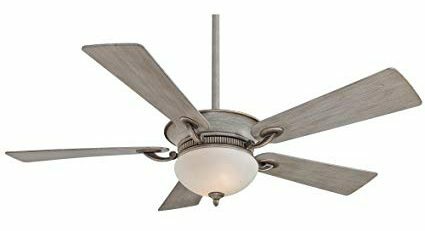 If you’re looking for a more versatile fan that can be used both outside and inside, this weathered gray ceiling fan with light is for you. With a very sober design, its clean lines and a style with a maritime air, making it ideal for beach houses or any house that enjoys a sea-like decoration. Thanks to its weathered burnished grey pine blade, this fan endures the inclemency of the outside, which makes it ideal for garages, decks or even roofed gardens. As it’s damp rated, it won’t be affected by moist or even intense sun. At the same time, is perfect for big inside rooms such as living rooms or master rooms thanks to its beautiful design and quite functioning. It’s controlled by a handheld remote that controls both the lights and the fan. The lamp which is seeded glass includes a 5 watt LED bulb that lasts pretty long. The handheld control allows you to dim the lights in full range as well to change the three different speeds on the fan. It includes pieces for three different mounting styles including angled, low and high ceiling. Very resistant even for salty weather, ideal for beach houses. The LED light is neutral white. It may be a bit hard to install. The remote controller is not very responsive and it may take a few hits to work. The fan reverse button is behind the glass making it hard to access. Yet another maritime design but with a bit more warm light and classic cord controls, this weathered zinc ceiling fan is ideal for outdoors where the climate is inclement. It’s ETL damp-rated and, as the controls are manual you won’t have to worry about any circuit failing. The nautical design – slightly less rustic than the previous model -, combines with a sophisticated style while still giving that sea-like atmosphere that beach houses, covered porches, and pergolas need. Unlike the Coral Gables, the Key Biscayne includes a reversible motor that allows you to easily switch the air flow according to the humidity and temperature of every day. Even though it’s ideal for outdoors, its WhisperWind motor technology makes it so quiet that you could easily install it in your bedroom and it will work flawlessly. Weathered zinc ETL damp-rated makes it really resistant even in the hardest weather as beach porches, it seems like it will last a lot in whatever condition. 5 burnished reversible blades with 13° pitching guarantee a strong airflow. 2” and 3” downrods included for installing according to your ceiling needs. Some of the pieces are hard to identify whether they’re or not in the right position, making it a bit hard to install. The light might be a bit too dim. A very modern and contemporary design decks up this weathered wood ceiling fan from Fanimation that matches the most sophisticated and refined cutting-edge decorations. The blades are a combination of weathered wood and composite-metal and they’re 75” what makes them very powerful for the slow spinning, giving a really strong airflow. 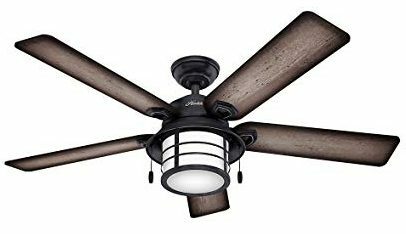 It’s ideal for indoors and it has an incredibly quiet technology that has no match in any other classical or modern fan. The Star design allows the light to be distributed widely and the LED bulb allows a subtle light that still illuminates quite well. It’s without a doubt one of the best fans in the market. Handheld remote and Bluetooth fansync that can be controlled by a wall control. Rated for damp locations allows it to be used both indoors and outdoors. Dimmable energy star allows you to adapt the light to your needs. One of the quietest fans in the market (if not the most). Very stable despite its long blades. It may be hard to install if you’re not handy. The blades quiet technology comes at a price and it may take a few seconds to understand in which direction they may spin when you turn it on. The remote is not as responsive as it should be and it may take a few clicks to work.